None of them are what we would call good Samaritans. “You’re such good people!” says the man that is receiving the donation to help the porpoises. It’s ironic in a sense because no one in the film seems to do good things. My synopsis: Alex and Richard are a happy couple hoping to adopt a child and settle down in to the house of their dreams. Turns out that very house is also wanted by Alex’s sister Paige, and it also happens to have almost $1 million in cash hidden inside. Through a series of almost random events Alex and Richard end up with the money and it causes all kinds of havoc in their lives. Meanwhile a sibling rivalry gets intense. A lot happens in this movie. It starts out rather mundane in that this couple wants to buy a house, and Edendale, which isn’t even for sale, is their dream house. They end up crashing a party at the house, and by luck end up house sitting for the owners while they are in Bhutan. Of course they find the money and the instant wealth changes things for them instantly. This is where the mundane starts to turn into the absurd. I likened this story to chasing mice. It goes quickly from one thing to the next sometimes not developing one particular part of the story as it might have before moving on to another. It certainly keeps you on your toes much like paintballs flying at you from multiple directions. I wonder if the story might have had more depth if they had left some parts of the story out and focused more on developing the characters and their relationships. In one of the first scenes of the movie we have the line “change comes from within.” This sets a framework for the theme of the film. The house, the money, the dogs, the crazy ugly statue.. all of these things are external. They do cause change, but they do so in a quick, surface level way. And perhaps the mad pace of the film is there to enhance that feeling – that all these things are happening to this couple but nothing changes fundamentally. It’s not until some really crazy drama happens that maybe we see some change happening. I give credit for the uniquness of the film – I don’t think I’ve seen another gay-themed movie quite like it. 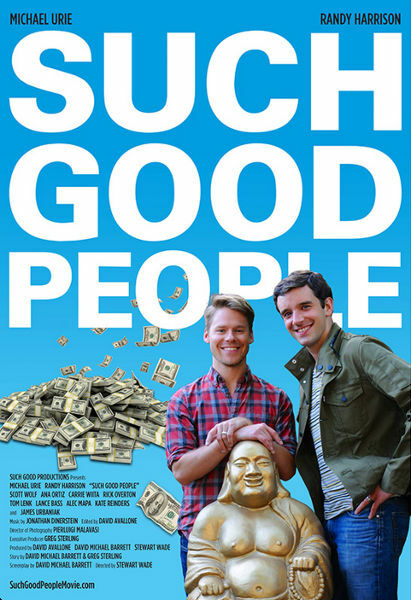 There are some good themes in it, some good lines, and great acting by Michael Urie and Randy Harrison. And although I felt like some things were missing from it I would watch it again, and that says something for it. For now it’s in film festivals, although the soundtrack is available on Amazon.